Dormant Oil Sprays: The first pest control applications in tree fruit usually consist of oil and copper sprays. These are long standing standard recommendations that are not without special considerations. Oil is generally recommended at rates of 2%, or 2 gals. per 100 gallons of water for dormant applications. Traditionally this has translated to 4 gallons of oil per acre for stone fruit based on a dilute volume of 200 gallons per acre: the amount generally considered to cover a mature peach tree to the point of drip. For pome fruit the recommendation has been 6 gallons of oil per acre based on a dilute volume of 300 gallons per acre: the amount generally considered to cover a mature semi dwarf apple to the point of drip. To adjust the dilute volume required for immature orchards and trees on dwarfing rootstocks consult pages 25 and 26 of the 2011 New Jersey Tree Fruit Production Guide. Oil acts by suffocating overwintering scale insects and mite eggs as they begin respire in the spring. Since fruit tree architecture includes many cracks and crevices as well limbs and twigs that exponentially increase surface area, coverage to the point of drip is key. Coverage is never perfect and since a single female san jose scale can produce up to 400 crawlers per generation, it’s important to try to get as close to 100 % coverage of the scaffold and trunk surface area as possible. It’s worth mentioning that opening up canopies with proper pruning can go along way toward accomplishing that goal. Oil can be safely applied up to the pink stages of peach and apple. Delayed dormant applications applied for mite suppression will effectively control scale. Multiple applications are often recommended in apple and may be beneficial where both scale and mites are a concern in peaches. Since conditions are seldom optimal for good coverage in the spring, multiple applications also help to get close to the 100% goal. Where multiple applications are made the rate is generally dropped the closer an application is made to bloom. So a split application in apples for example might consist of a 2% application up to ½” green, and a 1% application up to tight cluster. An application @ ½ % at pink is an option that may provide additional insurance. One sees many recommendations for mixing OP’s such as Lorsban or Supracide with dormant oil applications to improve scale control. The general consensus seems to be that the addition of these materials is of little benefit. These materials also increase the risk of oil phytoxicity from cold temperatures. These organophosphates also control rosy apple aphid, however in recent years we’ve observed poor control due either to resistance or more likely, poor timing. Combinations of oil with the IGR’s Esteem or Centaur should improve scale control in heavily infested orchards. Esteem at this timing will also control rosy apple aphids. Oil is also useful to deter early season egg-laying by pear psylla since adults are repelled by oily surfaces. The objective is to delay egg deposition for as long as possible so that most of the hatch occurs after bloom. We can then target the nymphs during a compressed hatch period. Egg-laying usually commences by early March and gets into full swing by late in the month. So it is good to get the first application of oil on pear trees as soon as the weather permits in March. Oil should not be applied when temperatures are expected to drop below freezing within 48 hours of application. Dormant season copper Sprays: Coppers are early season fungicides recommended for early season scab control and fire blight suppression in apples and pears. Coppers are also used for peach leaf curl control. Many different copper formulations are available and it’s often difficult to decide which one is best. Care must be taken when applying copper to prevent unintended consequences. Copper phytoxicity takes the form of leaf damage on stone fruit and leaf and fruit injury on pome fruit. We recommend season long copper applications at very low rates in peach for bacterial spot suppression. But significant phytoxicity can occur from tank mixes, especially when applied after a long period of overcast weather, and/or the spray water ph is less than 6. Therefore it’s recommended to have some ph strips and buffer on hand to test the finished spray mixture and adjust the ph to lessen acidity if necessary. On apples and pears coppers should not be applied much past green tip unless fruit finish is not a concern. Copper ions present after half inch green can cause russett, especially on sensitive varieties. The risk of fruit injury is increased in years with little rainfall between bud break and pink, because more copper will be present when the fruit is fully exposed. 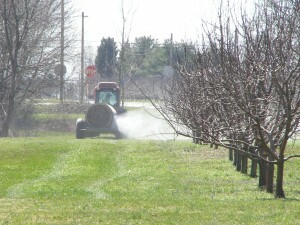 Dormant season urea sprays: One final early spring chore is to get a jump on apple scab in orchards that have high inoculum from the previous season. Here orchard sanitation using urea or by shredding leaves is of benefit. Last season’s leaves carry the overwintering inoculum of the fungus. Urea works in two ways to reduce this season’s inoculum: it helps organisms in the groundcover decompose the leaves quickly; it also suppresses the development of spores so that they are not released. Alternatively, chopping the leaf litter with a flail mower will accomplish the same end. This is useful for getting the upper hand on primary scab control and for resistance management. Urea is applied at rate of 40# per acre in 100 gallons of water per acre. This can be applied with an airblast sprayer with the nozzles directed at the ground cover. It is best done before bud break but can be applied as late as green tip. Applications made later in the spring should be done with a boom sprayer since urea drifting onto green tissue may make it more susceptible to phytotoxicity from copper or oil sprays.